Motorola just hit refresh on the on its smartphone lineup and introduced the New Motorola Droid Razr family. 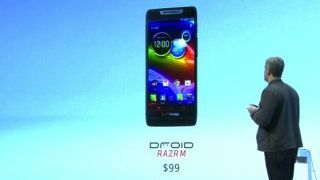 The Droid Razr HD, Droid Razr Maxx HD and the Droid Razr M were all unveiled today at an event in NYC. Motorola's co-conspirator for the event was Verizon, the exclusive carrier for this New Motorola Droid Razr family. Each phone is set to launch on Verizon's 4G LTE network. Here's a look at what you need to know. Each member of the new Motorola Droid Razr family is built around a 1.5GHz dual-core processor and 1.5GB of RAM. The Droid Razr Maxx HD, Droid Razr HD and Dorid Razr M offer 32GB, 16GB and 8GB of on-board storage, respectively. Each has the option to add up to 32GB of extra space via MicroSD. NFC (near field communication) chips have been confirmed for each phone, making them ready for services such as Google Wallet. The Droid Razr Maxx HD and the Droid Razr HD are the big brothers of the new Motorola Droid Razr family, with 1280 x 720 resolution screens that measure 4.7-inch. The Droid Razr M packs a 4.3-inch display with a 960 x 540 resolution. Each of the new Razr multitouch displays will be encased in Gorilla Glass 2 for extra scratch resistance. The new Motorola Droid Razr family of phones will features 8MP video cameras across the board, capable of capturing video at 1080p. Each phone will also have a front-facing chat camera at 1.3MP on the Razr Maxx HD and Razr HD, and VGA resolution in the Razr M.
Being owned by Google hasn't enabled Motorola to ship the new Motorola Droid Razr family with Android 4.1: Jelly Bean, the latest Android OS. Instead, each phone will arrive in stores with Android 4.0: Ice Cream Sandwich, and then receive updates to the newer OS by "the end of the year," according to Motorola. Chrome will be the default browser at launch. Today's official unveiling of the Motorola Droid Razr family in NYC was co-hosted by exclusive Droid Razr carrier Verizon Wireless and manufacturer Motorola and Google. While Verizon's 4G LTE network is a centerpiece of the push for this new smartphone, it will of course run on 3G, if Verizon's 4G network is not available in your area. The Droid Razr M will be Mobile Hotspot capable, able to connect up to eight devices on 4G, and five on 3G. Of the three phones in the new Motorola Droid Razr family, only the Razr M was given a firm release date. Set to launch Sept. 15, pre-orders are now being taken for smaller phones in the new Razr family. The Droid Razr M will retail for $99.99 with a two-year Verizon contract. Now that Motorola and Verizon have pulled back the curtain on the New Motorola Droid Razr family, we'll be posting our hands-on impressions soon. Stay tuned for our initial thoughts and our reviews of each member of this new family.